1. It's something VERY different! 2. It's totally AWESOME and amazing FUN! 3. It's a MEMORABLE EXPERIENCE that creates something you can KEEP! 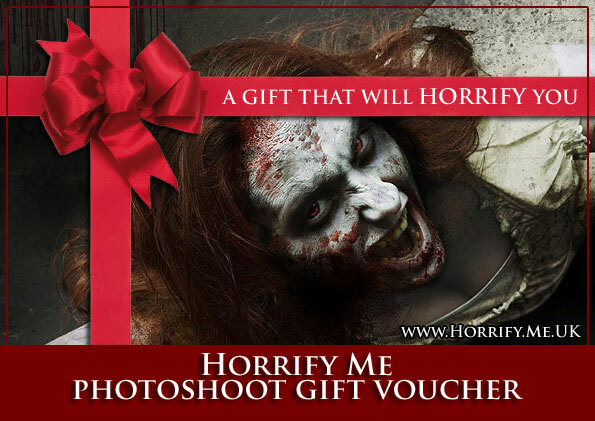 Horrify your Friends and Loved Ones with our Gift Voucher! Seriously! Choosing gifts for people is so hard these days. Purchase someone a photoshoot with us and they'll love you for it. The shoots are messy, fun, creative and provide lots of laughs and memorable moments; a truly great experience all-round with awesome memories and stunning photos. We reckon it's the best gift ever! This is a truly unique and unusual gift that you will struggle to match for quality and fun. What better gift can you buy someone than transforming them into a horrific rotten walking corpse, or a blood-drooling vampire? Please complete the form below and follow the instructions. Payment is via PayPal. You can set the value of the gift voucher to any amount (minimum £50). The recipient can redeem this voucher against the price of their photo shoot with us. Once your purchase is completed you will get a unique serial code. Whoever "spends" the voucher with us only needs to bring this serial code along with them in order to redeem the voucher. We will verify the code on our system and validate it. Provided the code matches and the expiry date has not yet expired then the voucher can be used. We will only redeem the voucher after we have verified the code. This gift voucher is only good for a single transaction; any remaining amount is not exchangeable with cash or another voucher and will be automatically forfeited. Any additional cost exceeding the value of this voucher will be paid by the redeemer. This gift voucher will be considered null and void if the expiry date has expired or the unique serial code is proven to be invalid. Refunds are not given on date-expired vouchers. This voucher is valid only at "Horrify Me" and is only redeemable for the goods and services specified at the time of purchase. In the event of any dispute, the decision of "Horrify Me" is final. "Horrify Me" reserves the right to amend these terms and conditions without prior notice. Voucher validation is required by authorized person only. Voucher allows for no travel costs and assumes photoshoots to be done in our Kent studio. Voucher is non-refundable.